Is Israel diplomatically isolated? Not if you ask the majority of countries in Africa. Prime Minister Benjamin Netanyahu met on Monday in Jerusalem with Togolese Foreign Minister Robert Dussey, who invited the Israeli leader to pay an official visit to Togo and to participate in the Africa-Israel summit for high-tech, communications, agriculture and security, which takes place in October. Netanyahu accepted the invitation. Dussey estimates that 20-25 national leaders will attend the summit. 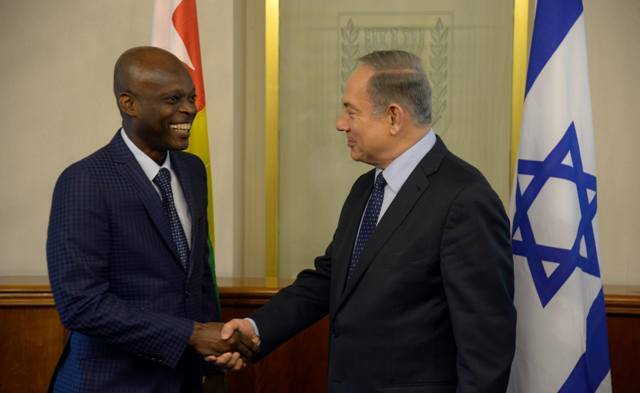 “I want you to know how glad we are that we are strengthening even further the relations between Togo and Israel,” Netanyahu told Dussey. “You know our big thrust of coming back to Africa, but you were always there, and for us, very important [are] not only our relations in East Africa, but also in West Africa,” where Togo is situated. “So I look forward to having the opportunity to visit West Africa – visit with you and the president and others, because we are absolutely committed to having this resurging relationship between Africa and Israel,” Netanyahu stated. “I come back to your beautiful country Israel, particularly Jerusalem. I’m very happy because I would like to invite you to Lomé, the capital of Togo, to attend the African and Israel high technology and security summit next October, in Lomé,” Dussey responded. “You were in East Africa. We don’t want to give you only West Africa. We want to give you all African countries,” he declared. Togolese President Faure Gnassingbé visited Israel in August. Israel has helped Africa technologically in a number of sectors, particularly in agriculture by introducing techniques such as drip irrigation, which is especially useful in arid climates. Netanyahu has made improved relations with African nations a priority. Last July, he made an historic trip to East Africa, where he visited Uganda, Kenya, Rwanda and Ethiopia. Weeks later, the Republic of Guinea, a Muslim-majority African nation, restored diplomatic ties with Israel after a 49-year break.